Lilac Tree Cottage01263 715779work01603 870304fax Self-cateringLilac Tree Cottage adjoins the owner's home in the small hamlet of Eastgate. There is a comfortable sitting room in which to relax with a wood burner for those chillier evenings. Pets: One small well behaved dog welcome. Rooms: 1 Bedrooms 1 bathroom, 1 kitchen, 1 dining/sitting area. Outdoors: Fully enclosed courtyard with table and chairs. Access: Driveway for two cars, shared with owners. 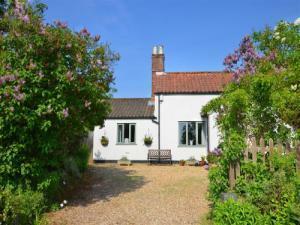 Lilac Tree Cottage adjoins the owner's home in the small hamlet of Eastgate. There is a comfortable sitting room in which to relax with a wood burner for those chillier evenings.